During the parade, I met up with Amitava Sarkar, the coordinator of AJWS’s grantee Saathi Seva and a leading transgender activist in India. 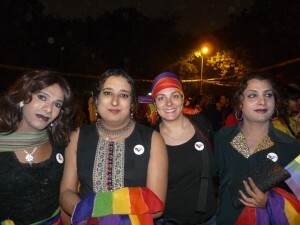 She had traveled from her native Kolkatta via Jaipur, where she had recently given a capacity building training for nascent LGBTI organizations from all over the country. She had brought a few activists with her from the Jaipur training and we danced our way through the streets surrounded by hundreds of new friends. 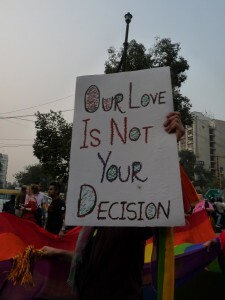 The atmosphere was euphoric – hundreds of people of all religions, castes, ages and sexual identities coming together in an outpouring of support for something that is still missing in this country: freedom for LGBTI-identified people to live without discrimination, stigma and prejudice. 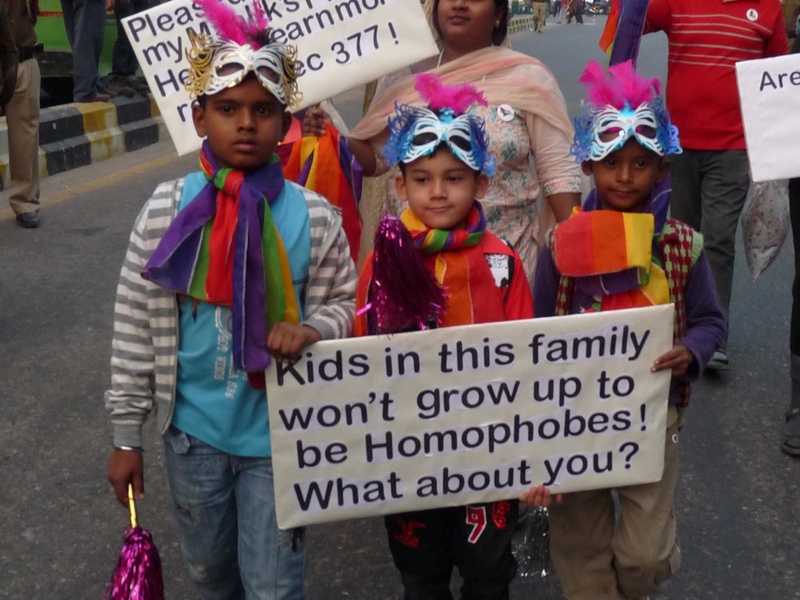 The Indian government took a giant leap forward when, on July 2, 2009, it repealed Section 377 of the Indian Penal Code that had effectively outlawed homosexuality in India. 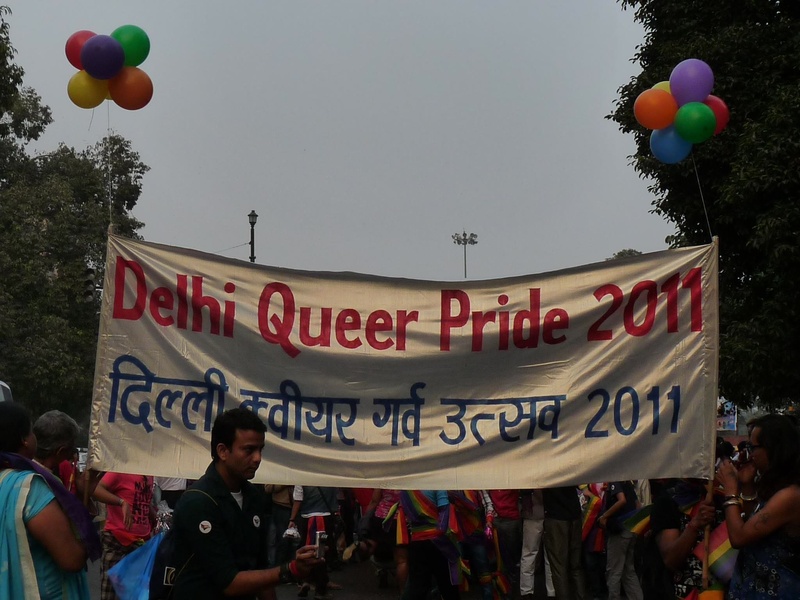 The first few Delhi Queer Pride Parades were understandably marked with some confusion and chaos. I heard stories from my colleagues and friends that these first few parades included outpourings of free love juxtaposed with silent and masked observers. The contrast between contemplative academics marching next to scantily-clad activists was striking. 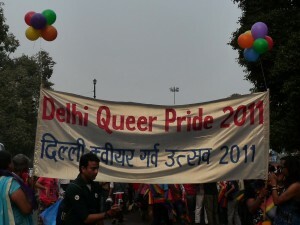 As we marched toward Jantar Mantar, a historic protest ground in the heart of New Delhi, I felt a unifying spirit in the crowd of the fourth annual parade: “Our love is not your decision.” We arrived at Jantar Mantar, where I stood with Amitava and her transgender sisters and listened to speeches demanding anti-discrimination laws to stop police violence against LGBTI people, ensure equal access to health care services and provide for greater spaces in educational institutions and the workplace – all issues that are at the core of Santi Seva’s work. These speeches were greeted with massive cheers from the crowd and spontaneous dance circles as the celebrations continued into the night. I left the crowd with Amitava and other transgender activists riding high on a wave of joy and excitement and headed toward Connaught Place for dinner. My happiness came to an abrupt end, however, when the teasing and harassment began. I felt myself bristling with resentment and anger at the open solicitations, catcalls and obscene gestures as I witnessed Amitava deftly chide local shopkeepers and restaurants for not keeping police forces around to protect their customers. Though I was impressed with her demeanor and poise in these interactions, I was left wondering what measures would still be needed to win the “hearts and minds” of the Delhi locals. 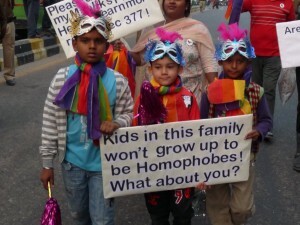 How do we change mindsets and stereotypes? From where can we draw hope? AJWS’s partners including Amitava and Santi Seva continue to remind me that change takes time, concerted effort and resources – one capacity building training, one community awareness session, one film session, one legal case and one household at a time. 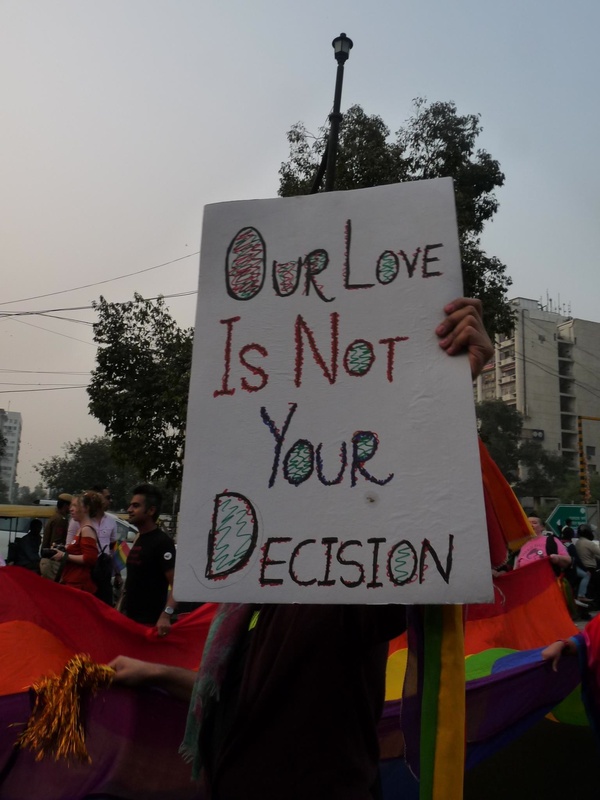 While the Pride march is one encapsulated moment of euphoria, the heart and soul of the work to facilitate these marches requires the Amitavas and the Saathi Sevas of the world. I am proud to call myself a supporter of this work. Sandhya Gupta, former AJWS Grants Officer, is the India Coordinator for the Tony Blair Faith Foundation. She supervises inter-faith fellows who are mobilizing local communities in support of the Millennium Development Goals, with a focus on maternal health and malaria.